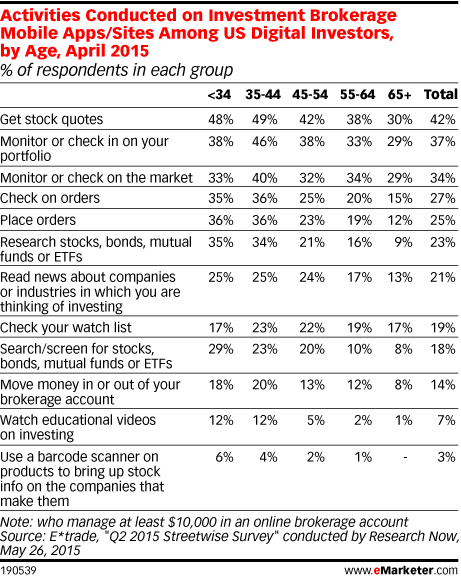 Data is from the May 2015 E*trade "Q2 2015 Streetwise Survey" conducted by Research Now. 1,002 US self-directed, active investors who manage at least $10,000 in an online brokerage account were surveyed online during March 31-April 10, 2015. The survey has a margin of error of +/-3.1 percentage points at a 95% confidence level. The panel was 65% male and 35% female with an even distribution across age ranges, geographic regions and online brokerages. E*trade is a financial services firm.